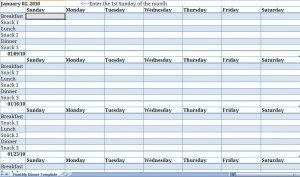 Use this monthly meal planner template to monitor your food intake for the entire month. It contains fields for each day of the week, meals, and snacks. Download this monthly meal planner today! To get the best use out of the template, simply input what you plan to eat in each corresponding column. Repeat this process for each day of each week and your meal planner will be complete.